Bank holiday weekend will be ushered in with a host of outdoorsy activities for all the family presented with an urban twist courtesy of It's Great Outdoors! Fancy camping out on the Southbank? The Big Sleepover on Friday promises free entertainment from 5.30pm with storytelling round a campfire and bush skills but you must book if you want to stay the whole special night. Tickets are £10 and include breakfast. Families welcome. A Crafty Hoedown on Saturday afternoon will see yeehas and thigh slapping with dancing plus ingenious radical craft in a tent. All free between 1-7.30pm. And on Sunday, the Alternative Village Fete sets up with "skew-whiff versions of everything you'd expect to see at a fete", artists, music and dancing, participatory games and free fun, fun, fun from 1-4pm, and again on Bank Holiday Monday, from 1-5.30pm. 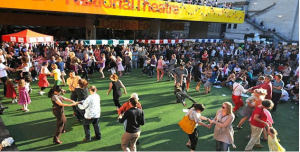 It's Great Outdoors starts on Friday 26 August with the Alternative Village Fete on Sunday 28 and Monday 29 August outside the National Theatre as part of Watch This Space Festival. Mostly free.